There are many different textures that make up the fabric (internal crystal mosaic) of Jersey rocks. These should not be confused with structures such as graded bedding or cleavage. A knowledge of what they look like and how they were formed helps to interpret the origin of the rock. They are recorded by Bishop & Bisson (1989) who cite their use by many other authors. These textural terms are not in one's common vocabulary, so brief meanings and implications are as follows (Allaby & Allaby, 1999). Gabbros & Diorites. (NW Igneous Complex). North-west granite; Bishop & Bisson, pp. 46 - 50). Ophitic. Large crystals of augite partly or wholly surrounding plagioclase crystal (Gk. ophis = snake). Augite (colour); feldpars (grey) (by kind permission of C.H.Donaldson ( MacKenzie, Donaldson & Guilford, 1982, p. 35). Poikilitic. Any large crystal, surrounding /enclosing several smaller ones, having grown faster than them (Gk. poikilos = multicoloured). Poikiloblastic. As above in a metamorphic rock. Ocelli. Areas of eye-shaped texture with one colour surrounding another (L. oculus = eye). Granites. (NW Igneous Complex). North-west granite; Bishop & Bisson, pp. 53 - 58). Perthitic. Alkali feldspars (orthoclase-K rich) with alternate layers - intergrowths - of orthoclase and plagioclase feldspar (Na rich-albite) which separated during cooling and unmixing; macro- to cryptocrystalline in size. 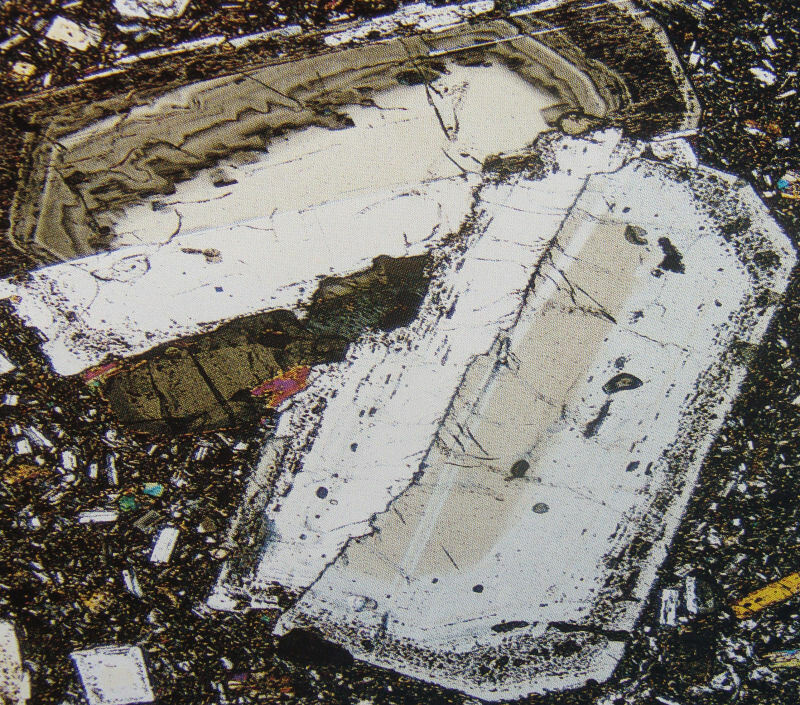 Microperthite; albite lamellae (l.gy) in large orthoclase (med.gy), upper centre-left (MacKenzie, Donaldson & Guilford, p.51). Granophyric. Small scale graphic, radiating intergrowth of quartz and orthoclase or plagioclase, formed by late, simultaneous, rapid crystallisation of the minerals between earlier crystals. Graphic. A large scale intergrowth of quartz and orthoclase looking like wedge shaped (cuneiform) writing. Porphyritic. Large crystals (phenocrysts. Gk. phaino = shine, show) which occur in a fine crystalline groundmass as a result of earlier, slowly formed, larger crystals mixing with a later stage, faster cooling melt. 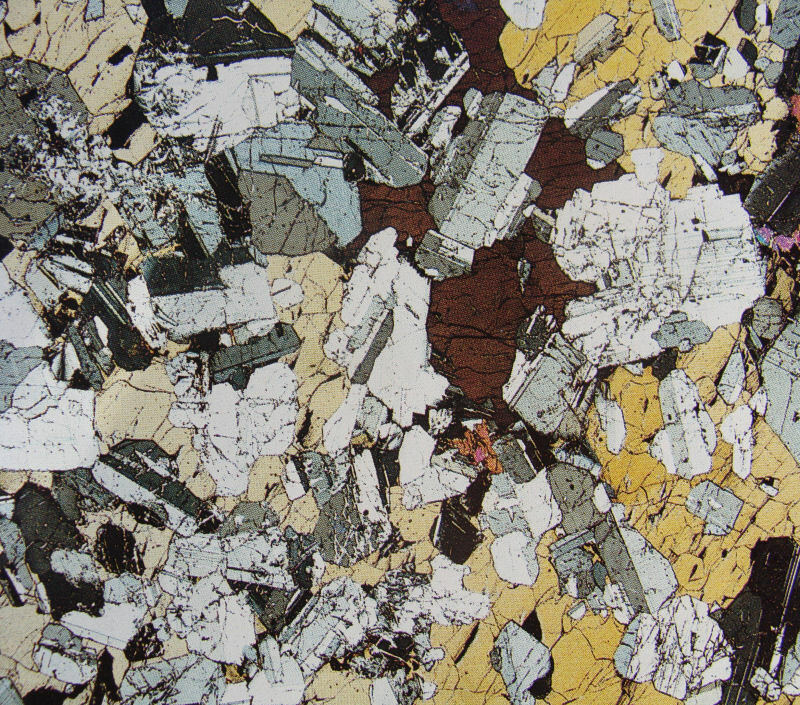 Porphyritic andesite (Germany; MacKenzie, Donaldson & Guilford, p. 16). 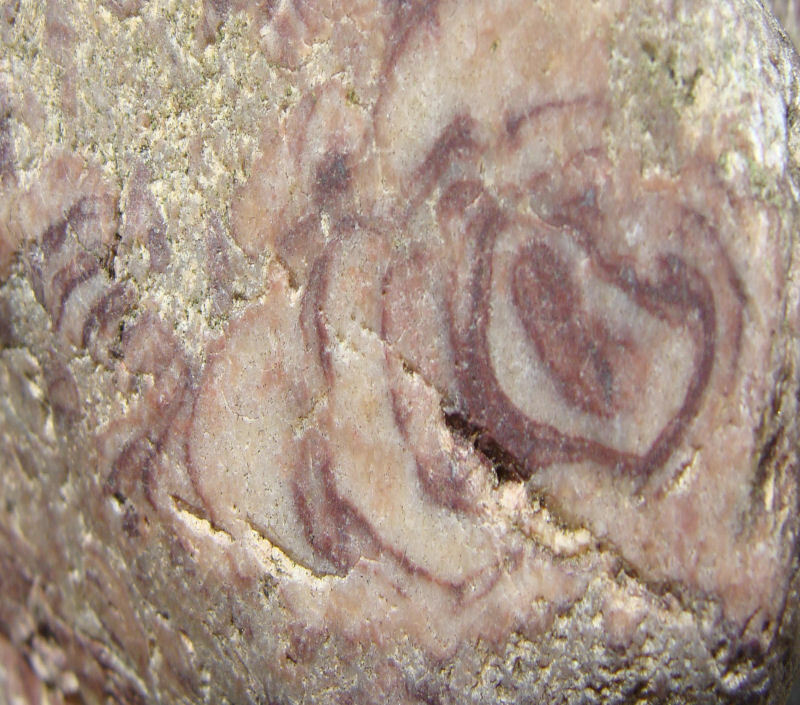 NB zoned and twinned plagioclase feldspars similar to local andesites. Crystal twinning. Twinning is a feature common to many single crystals where the crystal lattice is differently orientated in two or more parts of the crystal about a twin plane or twin axis, giving simple or multiple twins (Allaby & Allaby, 1999, p.138). Simple twin in orthoclase feldspar. Crystal zoning. 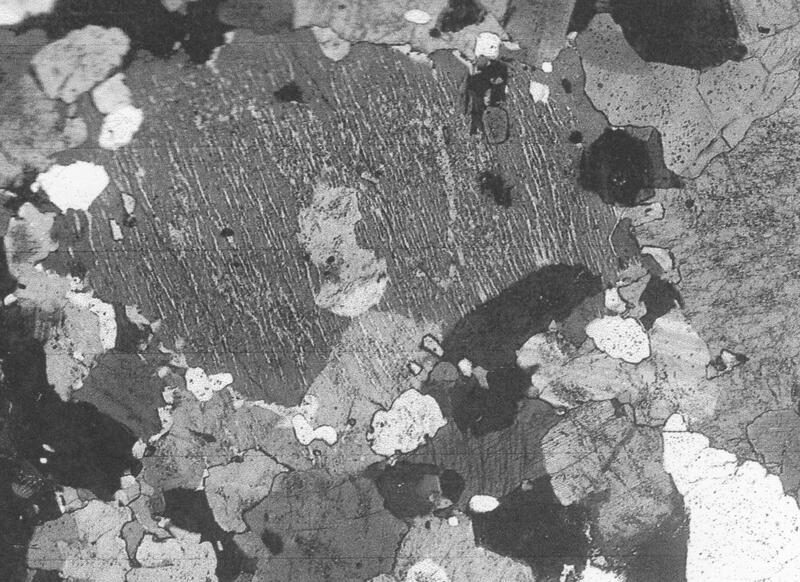 This texture is found mainly in the plagioclase feldspars which exhibit a colour change from the core to the rim, reflecting a chemical change between the zones. 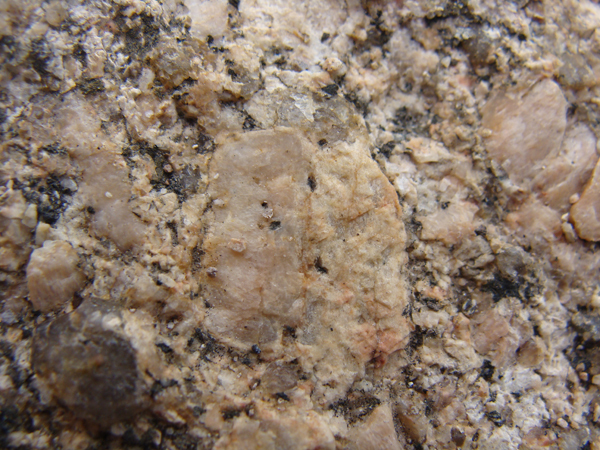 In Jersey granites the colour changes from red-pink to white-yellow (see Allaby & Allaby, p.139). Zoned feldspars, SW granite and zoned feldspars (porphyritic andesite), Japan. Dykes. (SE Igneous Complex). South-east granite; Bishop & Bisson, pp. 62 - 66). Aphyric. Composed of an aphanitic (Gk. a = not; phaino = shine, show) very finely crystalline groundmass with no large crystals, formed by rapid cooling due to loss of heat near its crystallisation (liquidus) temperature. Ocellar. Eye shaped texture with a patch of colour surrounded by another colour (L.oculus = eye). Granoblastic. 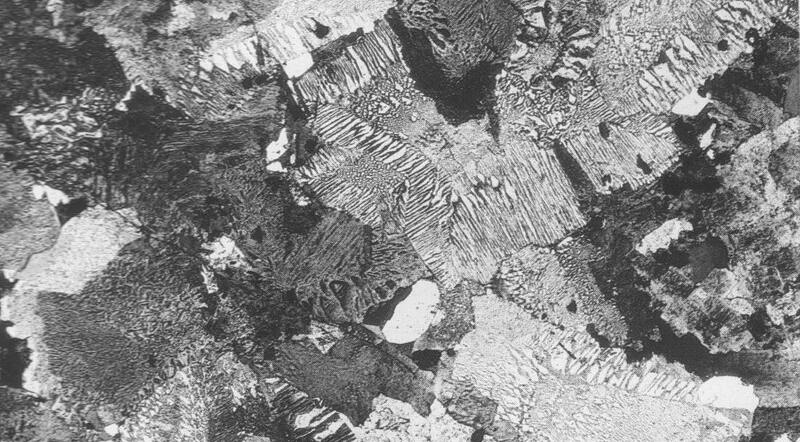 Mosaic of uniform, anhedral (no crystalline shape) crystals in a metamorphic rock. Spherulitic. 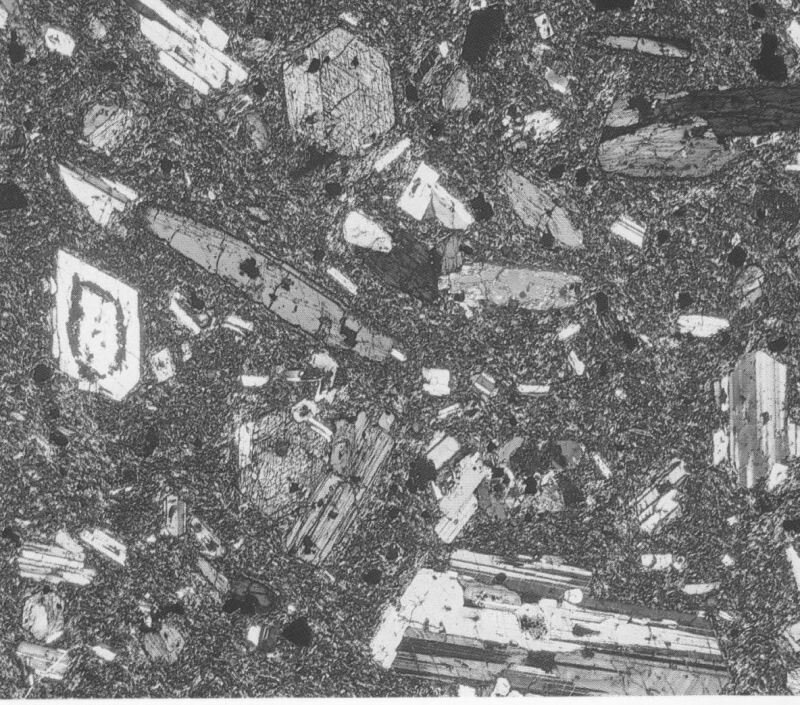 Composed of spheres or ellipses of radiating, fibrous crystals of quartz and orthoclase in a glassy or very finely crystalline felsitic matrix due to devitrification of quenched glassy igneous rocks (see Rhyolites and Mourant (1932). (Gk.sphaira = ball). 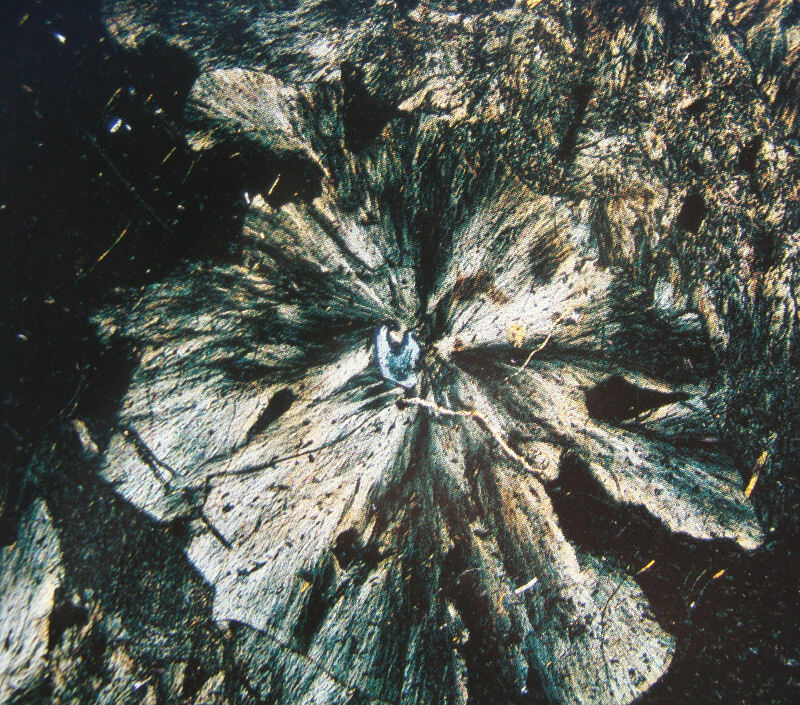 Radiating spherulite of fine intergrown needles of quartz & feldspar (alkali) (MacKenzie, Donaldson & Guilford, 1982, p.55) and local Rhyolite spherulite x1. Fig. 3. Meeting of two simple spherulites x23. Fig. 4. Same field; crossed nicols x26. Fig. 5. Crystallisation between felspar arcs x23. Fig. 6. Poikilitic structure x69. Fig. 7. Small rhythmic spherulite x23. Fig. 8. Small spherulite; crossed nicols x67. Fig. 9. 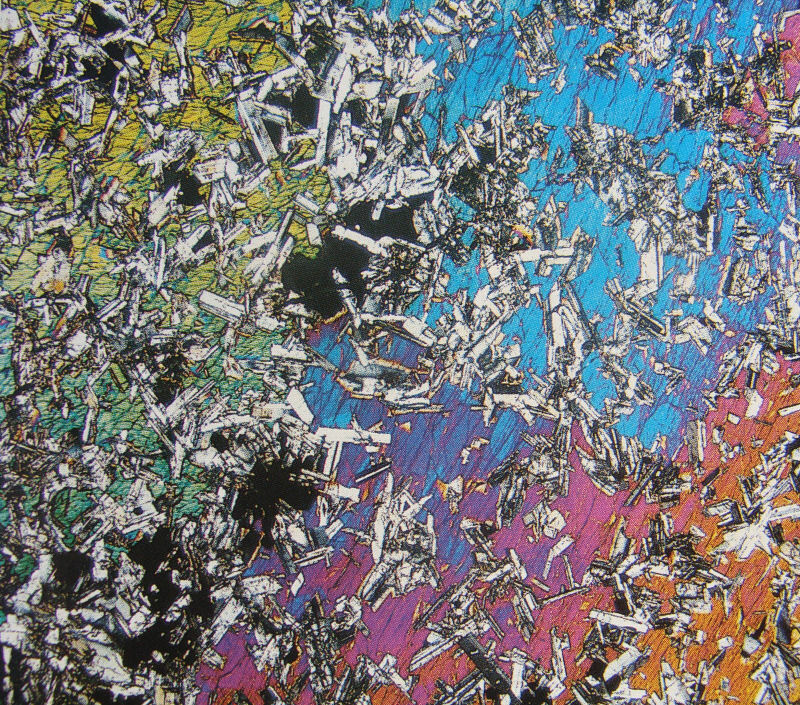 Complex spherulite; grey areas - felspar, quartz & iron oxide; white areas - quartz. x23. (Reproduced from a reprint of a paper by A. E. Mourant, M.A., D. Phil. in the Mineralogical Magazine, 1932, Vol. XXlll. No. 139, p. 238 & Plate Xl). MacKenzie, W. S., Donaldson, C. H. & Guildford, C. 1982. 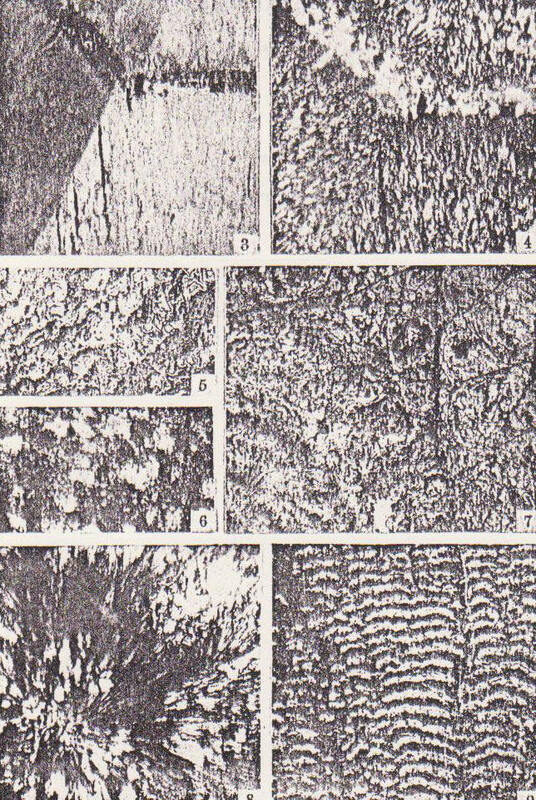 Atlas of igneous rocks and their textures. Longman. Mourant, A. E. 1932. 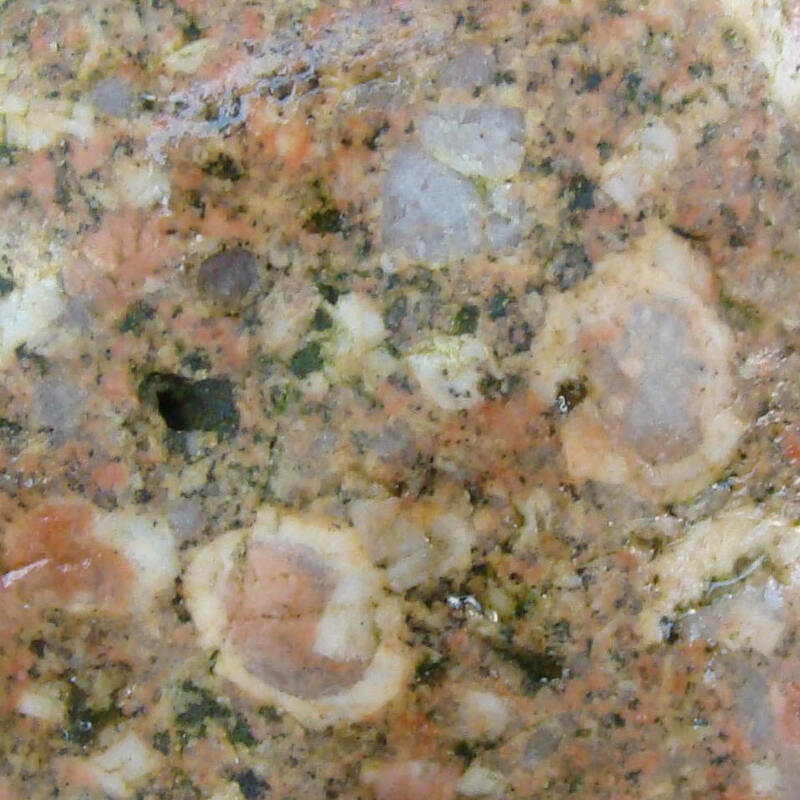 The spherulitic rhyolites of Jersey. Mineral. Mag. Vol. 23. pp. 227 - 238.